This project for a Toxicology Laboratory involved the conversion of a warehouse into offices on a new mezzanine floor, laboratories on the ground floor and a warehouse. £2.5 million turnkey geosciences laboratory design and build. This entailed iab providing offices, warehouse and laboratories. 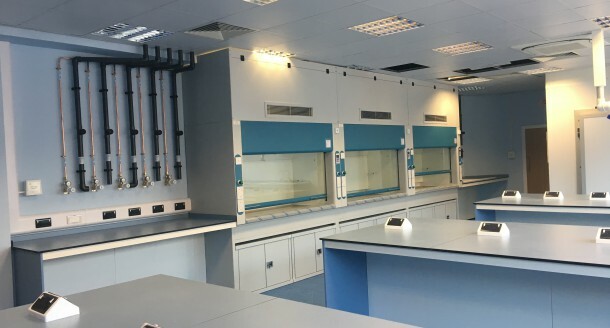 Working closely with the client iab designed and install the laboratory furniture, fume cupboards and over head service gantries. Following the success of a previous laboratory furniture project iab were employed to design the building internals. We worked closely with the architect to produce the tender. Attention to detail, outstanding quality, reliable delivery and project management are the cornerstones of iabs success. IAB's laboratory furniture products are designed & manufactured to the highest quality. All styles are designed around your needs to enhance your laboratory.